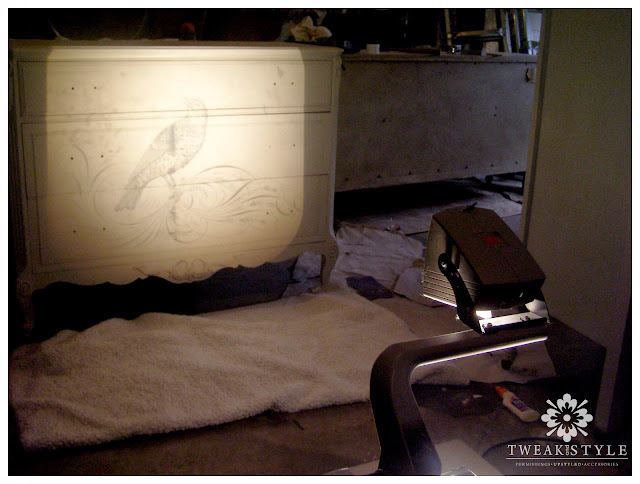 Often, I will have an idea of a paint technique or design I want to try on a piece of furniture, before I even have a piece of furniture to paint. That is how it started with this last project. I had purchased a dresser that I thought would fit perfectly an idea I had been carrying around in my head. However, when I got it home and looked at it closer, I really didn't like how the moldings on the drawers were going to break up the very graphic image I wanted to put on it. I walked around for days, taking quick peeks at the piece and trying to quickly give myself a mental snapshot of the image on it. Does that make sense to anyone? Well, I just wasn't liking my imaginary snapshot in my head so, ugh, I decided to bag that idea for later. Now, I knew I wanted to do a hand painted element on this piece, because I was just in the mood for some decorative painting. 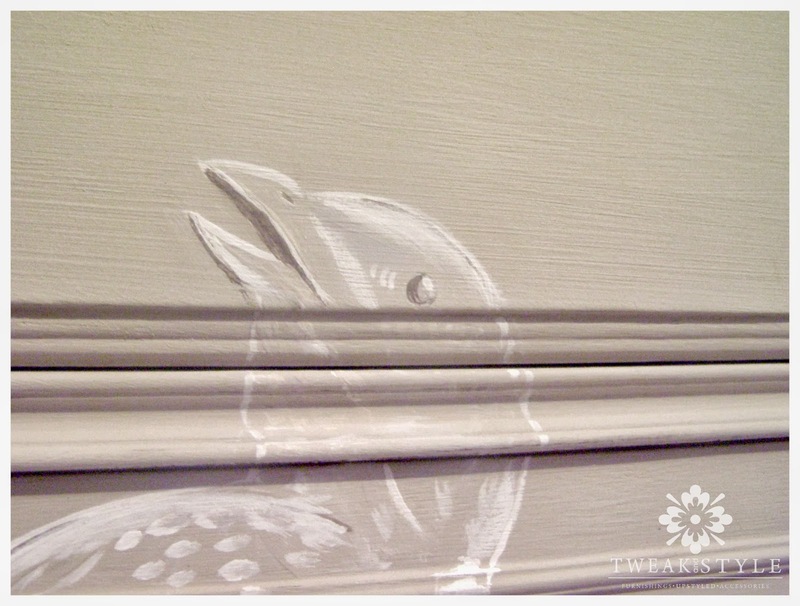 My design background is in murals and I really find hand painting enjoyable. So, I had to think of something else. So where does a girl go to find painted furniture design inspiration...The Graphics Fairy! The Graphics Fairy is my go to place for inspiration and let me warn you, like visiting Pinterest, you will get off task. You may head there to look for designs for a furniture piece, but before you know it you will find yourself perusing tutorials on how to transfer beautiful french images onto tea cloths! 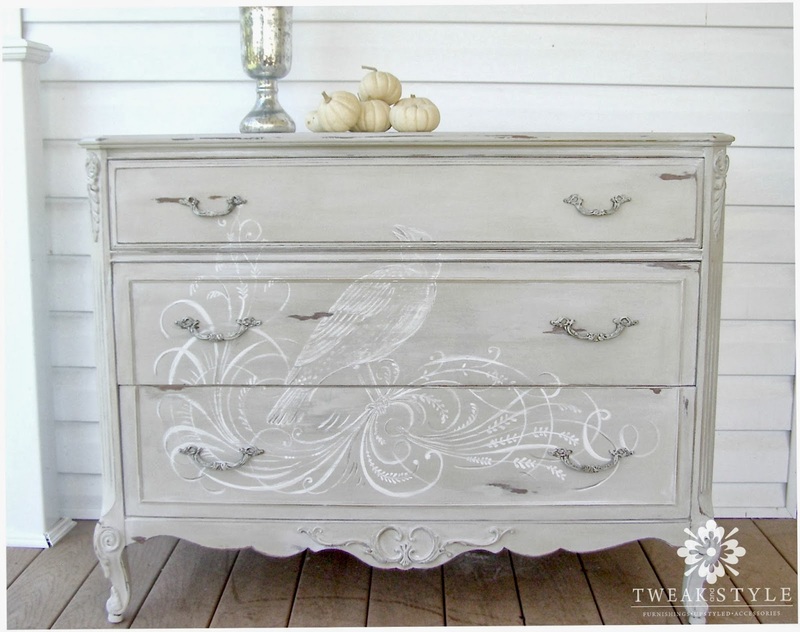 Although I am "groupie" for french typography, I wanted to find some sort of flourish pattern to pick up the curves on the legs and bottom of this dresser. I decided to do a spencerian flourish with a bird. I also decided to do the piece all in cream and white shades. 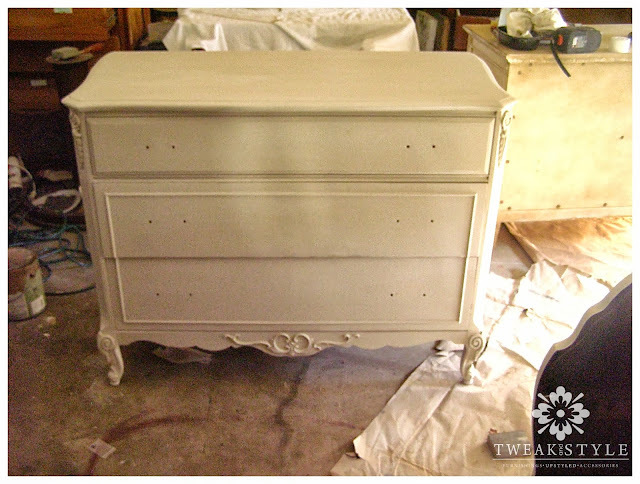 Below is the dresser basecoated in American Paint Company's Chalk Paint in the color Rushmore, a beautiful earthy stone off white. After selecting my graphic from the Graphic Fairy, I decided to transfer my image to my dresser using an overhead projector. 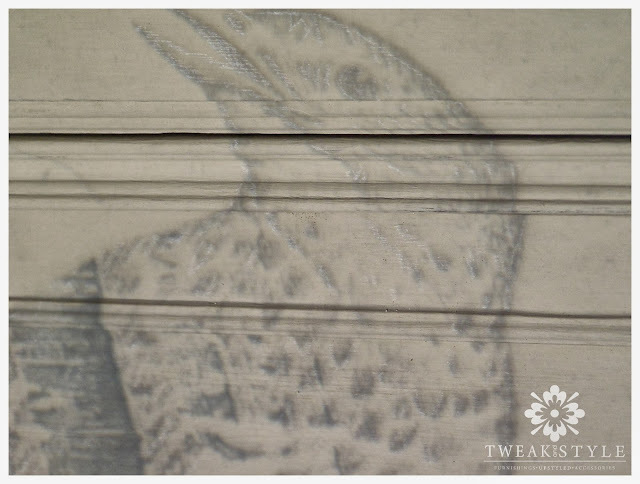 If you do not have an overhead projector, another great technique I use for transferring large images is using blockposters.com to enlarge pictures. You can find a tutorial on that at the at the Graphics Fairy here. tip..I didn't have transparency paper on hand and office depot is over 20 miles from my house, so in a pinch, I print out on a clear sheet protector we had laying around from my kids. Of course it will smear when you touch, but since you only have to use it one, be careful and don't touch it! To trace my images, I used a watercolor pencil. Find them in the artist section of Michael's or your favorite craft store. Choose a color closest to the color you will be painting with, so I used a white pencil. 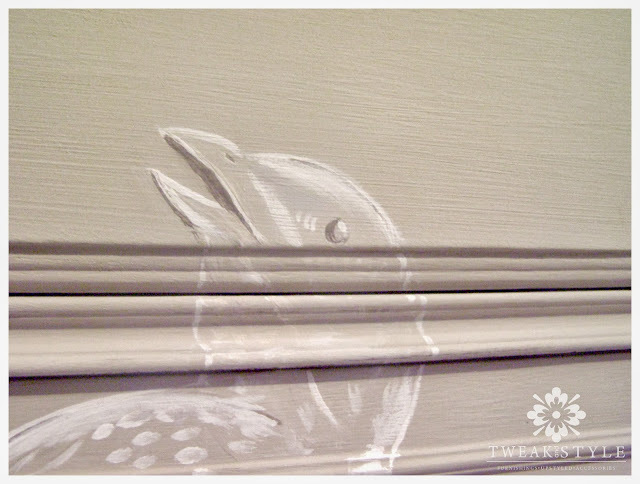 After painting and when dry, you can just wipe away stray marks with a damp cloth. 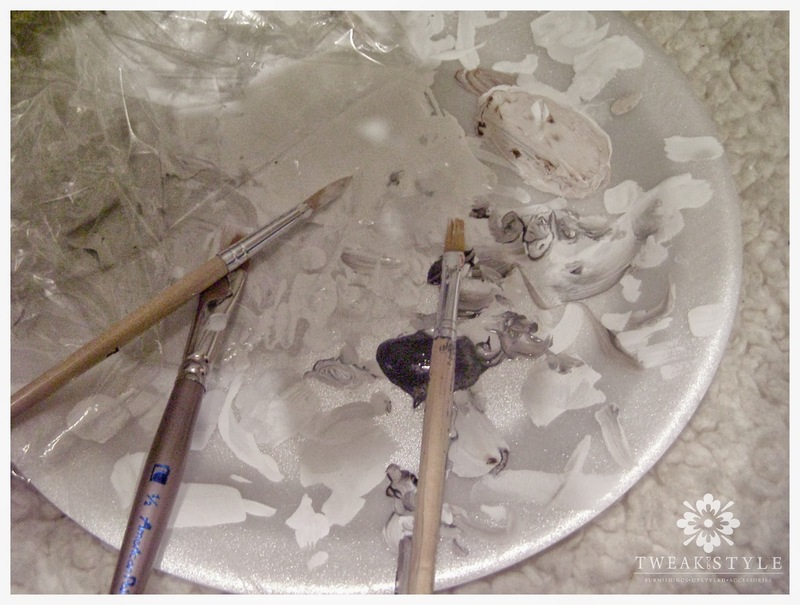 Here is how I usually set up my plate to paint. I poured out some white which was my main color, some Vandyke Brown tint I had on hand to add with white for lowlights (or you could use a raw uber or darker brown acrylic) and my brushes. Because this was more detailed work I used an assortment of smaller sized straight brushes, round and liner brushes and a filbert brush. I painted the whole mural in white first. To make my brush flow smoothly for long flourishes, I dip my brush in water first and then mix with the paint to make a creamier mix. Sometimes I even wipe the surface with a damp rag so my brush won't drag while moving it, but in this case, I did not want to wipe off my water color pencil! To create a little dimension, I added the darker accent color sort of as a shadow. 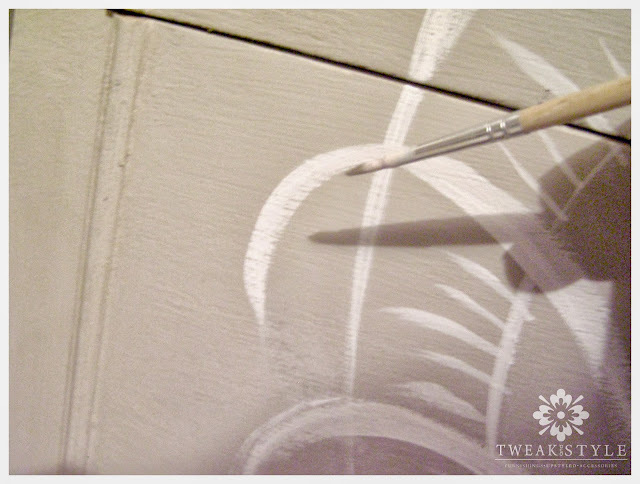 Adding it to the inside of swirls and underneath selected brush strokes. Again, mix water with this color to get good flow. After the mural was painted and had dried. I went over the whole piece with a 220 sanding block to distress. Paying closest attention to decorative details, corners and edges which is where a piece would naturally age first. I finished the piece with a top coat of American Paint Company's clear wax followed by Miss Mustard Seed's White Wax to give it an overall white wash. (I will be posting a separate tutorial for waxing this piece soon). Oh wow Debbie, this is amazing!!! 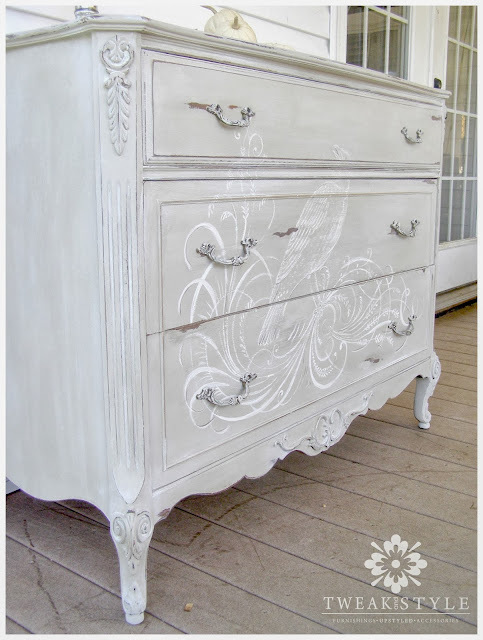 I think it's the most beautiful painted dresser that I have ever seen! Gorgeous job! HI, I discovered you through Hometalk. Amazing piece! 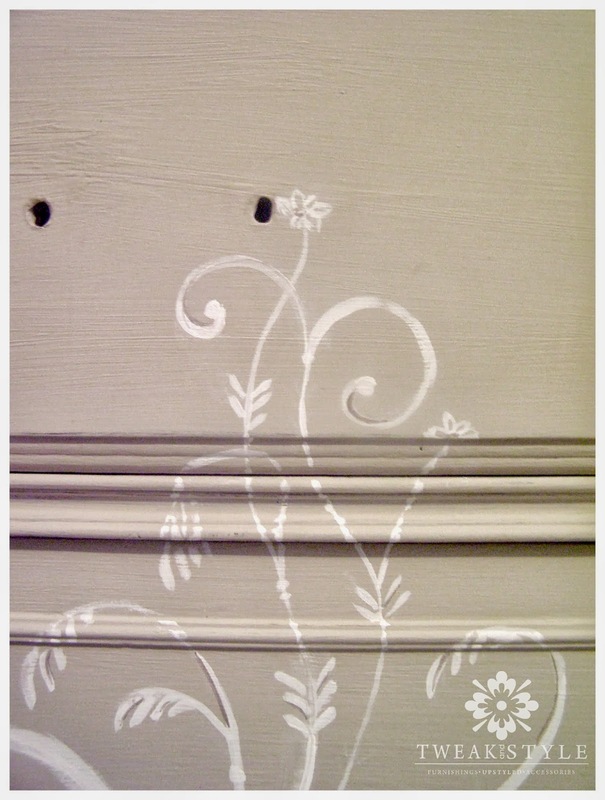 I do painted furniture too with typography and embellishments. Your piece id gorgeous! I have a projector but haven't really used it yet mostly do blockposters I really do want to try my projector more now will definitely have to!I picked up a few tricks from you thanks for sharing! !Will be following! This is gorgeous! Have a great weekend! turned out amazing, Debbie! that bird is so adorns! This is absolutely stunning! 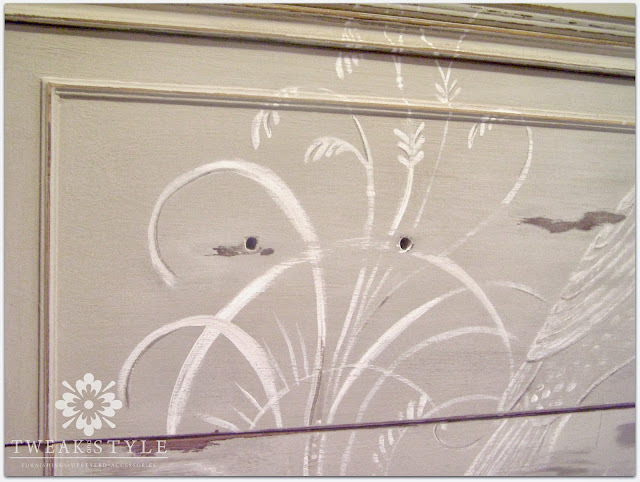 You are so talented, and this dresser is definitely a work of art. Absolutely gorgeous! Even with a projector that's a lot of work, beautiful! That is just a beautiful creation, your painting is amazing! What a gorgeous piece - definitely one of the most beautiful pieces I have seen. Great job! I am your newest follower. Really lovely. Usually not my favorite furniture makeover style, but I really admire this. Wow Debbie….this is amazing! 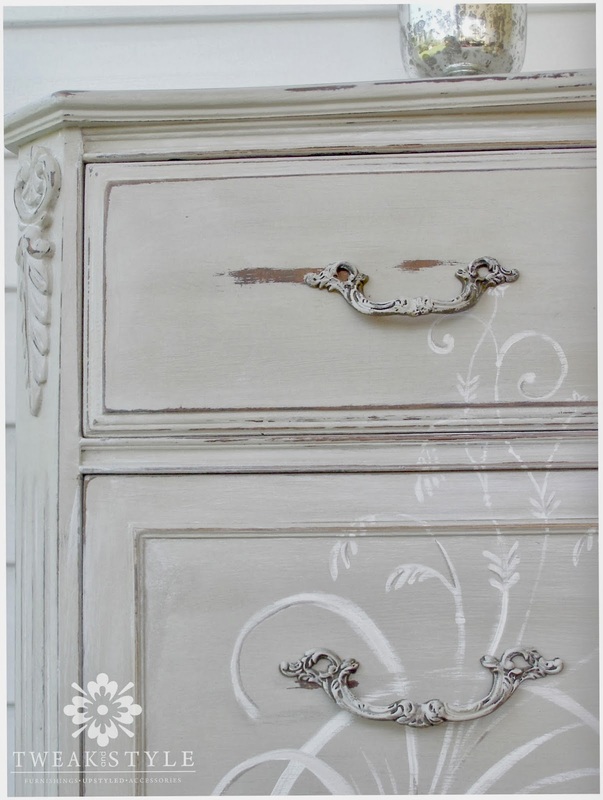 Love the details and the dresser color you picked. LOVE IT. 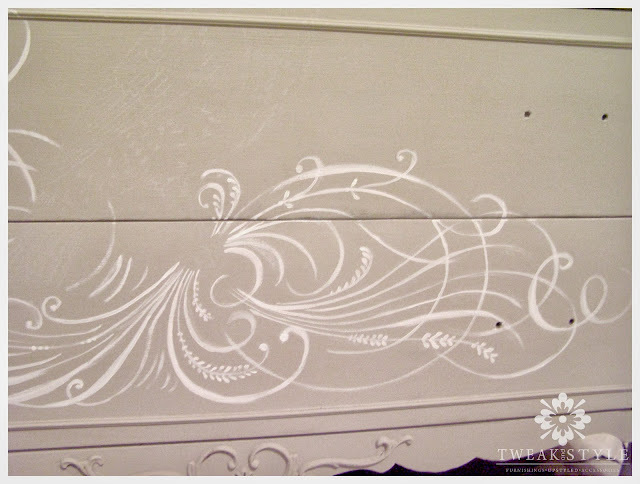 Lovely work on the dresser! Looks great! Beautiful! 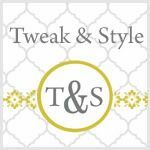 Visiting from SITS...I love it when they feature home improvement/decorating blogs! Now I'm off to look at more of your site! Your dresser is absolutely amazing!! I love it! 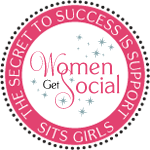 I am so so glad that I saw your blog on SITS! Pinning this! Wow, that is absolutely beautiful. So nice to "meet" you--have a great SITS day. Stopping by from SITS, this is gorgeous and such a great idea! I can't believe how easy you make it look! That is stunning! 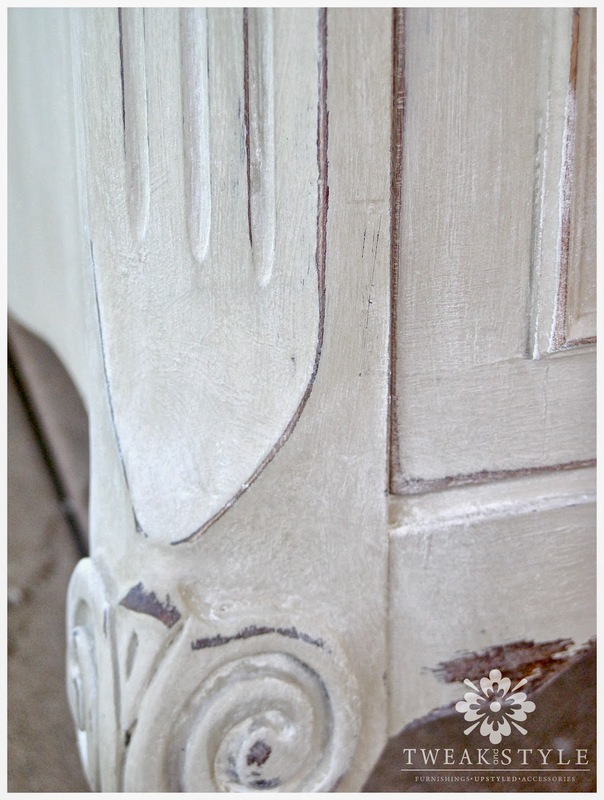 The extent of my furniture makeovers doesn't go past sanding and repainting. The details on this piece is amazing. Thanks for sharing, and happy SITS day! wow. That is seriously impressive. It looks daunting for me...but I would totally buy your work! Absolutely stunning...you are amazingly talented both in vision and execution. Happy SITS day! Happy SITS day! So glad I found your blog. This is a GORGEOUS piece. That is beautiful! Thanks for sharing and happy SITS Day! This looks amazing! 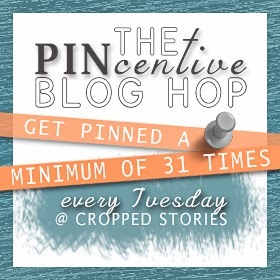 I love your blog and the ideas you have! I am moving into my own apartment in the next month and can't wait to do my own DIY projects. Hi Debbie, visiting you from The SITS Girls. Love what you did to that dresser. That is shabby chic at its best! Wow - this is so pretty! I am impressed and love the colors/neutrals you chose. Found you on SITS. Cheers! This is absolutely beauiful!!!!!! Following your blog & heading over to Etsy as well! Visiting from SITS. That dresser turned out amazing! Oh my gosh, you are so talented. I just refinished a dresser we bought at a Flea Market and holy cow - your work puts mine to shame! I wish I'd have read this first! Probably would have done everything differently! Keep it up, I love your blog! Absolutely stunning! You truly have an artist's hand! I'm in awe at how beautiful it is! Glass fencing for your pool keeps your yard open and spacious without compromising your family’s safety. Pool fencing can be as simple as a glass surround to add beauty to your yard while complying with government regulations to completely enclosed glass pool rooms. The frame less glass fencing assembly ensures a sleek and flawless look to match your pool.